There are currently an estimated 666,900 electricians in the United States. The electrician job market is expected to grow by 8.9% between 2016 and 2026. CareerExplorer rates electricians with an A- employability rating, meaning this career should provide great employment opportunities for the foreseeable future. Over the next 10 years, it is expected the US will need 67,000 electricians. That number is based on 59,600 additional electricians, and the retirement of 7,400 existing electricians. 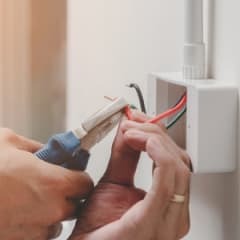 The anticipated excellent outlook for this occupation is related to the constant need for upkeep of increasingly sophisticated, computerized wiring and electrical systems. Considering that nearly every building has some form of electrical power, an expected rise in new construction will mean further job prospects for electricians. The ongoing need for maintenance of older equipment in manufacturing plants and emergency electrical repairs after storms and grid blowouts creates more demand. In addition, advances in power generation will require electricians trained in the installation and maintenance of solar and wind technologies. The linking of these newer sources of energy to home and power grids will become the responsibility of electricians. More than two-thirds of all electricians in the United States work for electrical contracting firms that supply building contractors. Only about ten percent choose self-employment. Entrance into the field is generally pursued following graduation from a technical school program, completion of an apprenticeship, and the passing of an examination testing knowledge of national and regional electric codes. Candidates’ specific job prospects will greatly depend on their skill levels, training, experience, and acquired certificates and licenses. Certifications in specialty areas such as instrumentation, electrical administration, and fiber optics will open doors to further opportunities. Those who qualify for a master electrician’s license will naturally expand their employability in senior positions. Simply stated, overall demand in the field is not expected to slow because electricians ensure safety of lives and property. What’s the supply of electricians?